There’s a certain freedom that comes from knowing that as much as I may want to lose weight, it’s more fun to not even try. So that’s why when I saw on the Travel Channel or the Food Network or some other channel earlier this year that there was a Chocolate Bar at the Langham Hotel here in Boston, I knew I’d get there sooner or later. Thankfully, Nina felt the same way I did, so we went with her husband today to celebrate my birthday, his birthday, and their anniversary in gluttonous style. I won’t go into great detail about how much I ate, but let’s just say I had my fill. 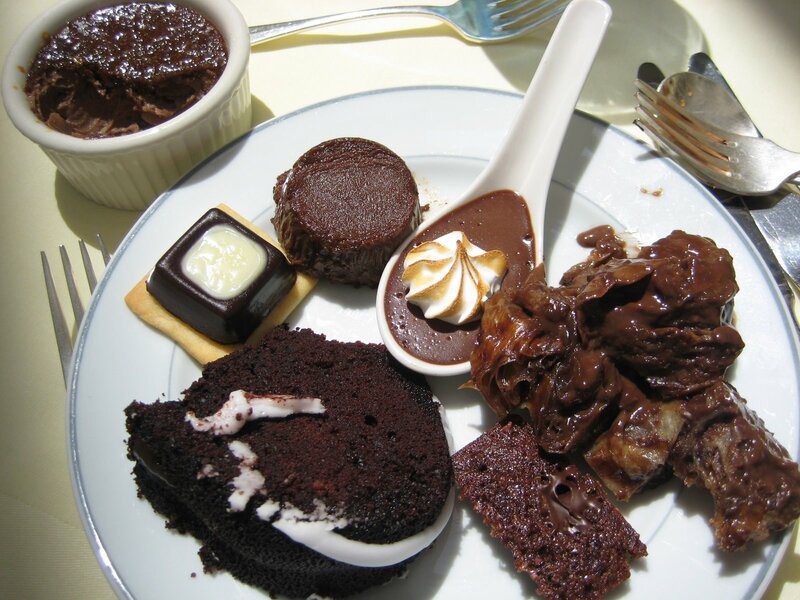 The mini whoopie pies were delicious, as was the chocolate croissant bread pudding, marshmallow crunch cup, flourless chocolate cake, s’mores cup … actually, it was all delicious. Yes, it’s true: I had a chocolate crepe stuffed with M&Ms, white chocolate, and Oreo pieces. 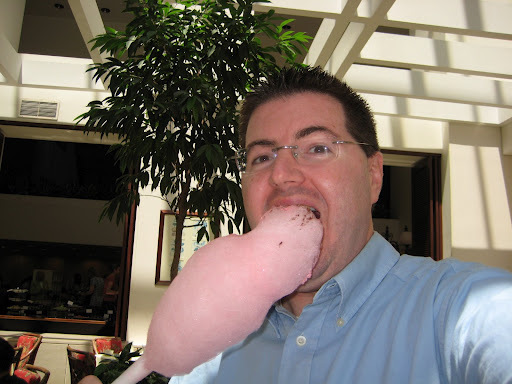 Yes, I called cotton candy (sprinkled with cocoa powder) a “palate cleanser.” Yes, there was a chocolate fountain. No, I did not make my own chocolate bar. And no, I did not eat everything I took on my plate the three times I went up to the buffet; after a while, I was getting stuffed just looking at it. But I feel like I certainly got my money’s worth (the whole thing costs a rather high $38 per person). Clearly, buffets are my weakness. But damn … how tasty and fun it is to indulge once in a while.